The dice was loaded, Ba rak Obama was in town, it was the November the 7th, the whole city was in a security blanket. The rumours were, the American President was travelling, with an entourage of 5000 persons. The last time, the American President visited, the rumour is that the canine force , that is elite Dog squad (in the US of A everything is glamorised),was put up at one of the better hotels. This time over, the year circa 2010, everyone was preparing for the Obama platter, The Hyderbad House banquets, banquets at the Rashtrapati Bhawan. The ceremonial guard by the PBG (President Body Guard). The legends of the presidential car called The Beast. Pages and pages of newsprint devoted to the Food ,Drink, Travel, Car and Clothes of the First Couple, acres of footage on News and Lifestyle shows devoted to the first couple. Amidst, all this chaos, the humble family of self, dearest wife Praveen and young Detective An, decided to have lunch at San G imignano, a quaint, traditional Italian restaurant at The Imperial.To match the royal occasion it was our 18th wedding anniversary. We entered it was noon, a crisp winter afternoon, the captain at the restaurant, one who started as a trainee and now runs the restaurant, offered us to be seated outside, outdoors (Alfresco). We, i.e dearest wife Praveen and I are suckers for Alfresco dining usually. However, today we politely refused. We enter we are seated, I order a Peroni beer, dearest wife Praveen orders a chardonnay, a nice one (the name, it is lost in folds of my cranium), besides I have lost the bills , so cannot even refer to them. The drinks arrive, so do breads. We settle down. Lo behold ! Hail Mary ! dearest wife discreetly says, just behind you, Ms Sonia Gandhi and Rahul Gandhi. Very slowly, we turn and discreetly observe the mother and son enjoying their lunch. Only once the visiting chef from Italy comes to click his heels to Madam and Baba. We let them be and indulge into our own reverie, a Caesar salad (came with a poached egg loaded with parmesan cheese, we had loads of bread with a red paste , made of red chillies/garlic/olive oil..... delicious (stayed away from the olive oil and balsamic vinegar we often have). We were told its a Tuscany recipe. Wife says, Rahul Gandhi is going on staring at you, perhaps he was trying to draw attention. Why is this regular family not making any signs of recognition, let alone reverence. The next course arrives it’s a ravioli with spinach and exotic cheese cooked with truffles and then we get on to a spicy Italian sausage pi zza. All the food is very nice, very good quality ingredients cooked to perfection. 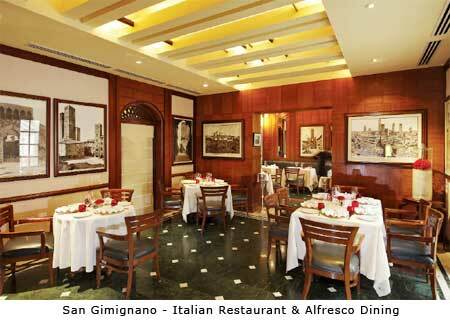 We look around the, sketches and pictures of the town San Gimiagno, the restaurant is named after. Here comes the Tiramasu, exotic 9with a hint of Alcohol). A Japanese enters the restaurant both smartly turned out and with a baby, they are again guided out, they resort to sitting indoors like us and unknowingly give company to Mrs Gandhi dressed in a salwar kameez and Rahul Gandhi wearing . errr do not remember. Enters Swati Piramal the head Assocham, wife of Ajay Piramal and publisher of a Business management magazine that prints 5000 copies. She was so poorly dressed. She asks Madam for a picture and flashes out a camera and the distinguished gent (captain of the restaurant) is summoned to click the photo. A Kodak moment for Mrs Piramal and Mrs Gandhi unwillingly agrees for a photo for the scrapbook. We cluck our tongues in despair. 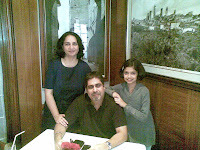 The Gandhis are ready to leave, thy look at us in admiration, we let them be all through their lunch and after. Swati did not, the Japanese did not know and care. We knew who she is and still kept our excitement to ourselves including little detective An. They left very discreetly like they are regulars without any hullabaloo and security, pretty much like commoners. And all this happened when the city and the country was trying to please the First couple of USA. 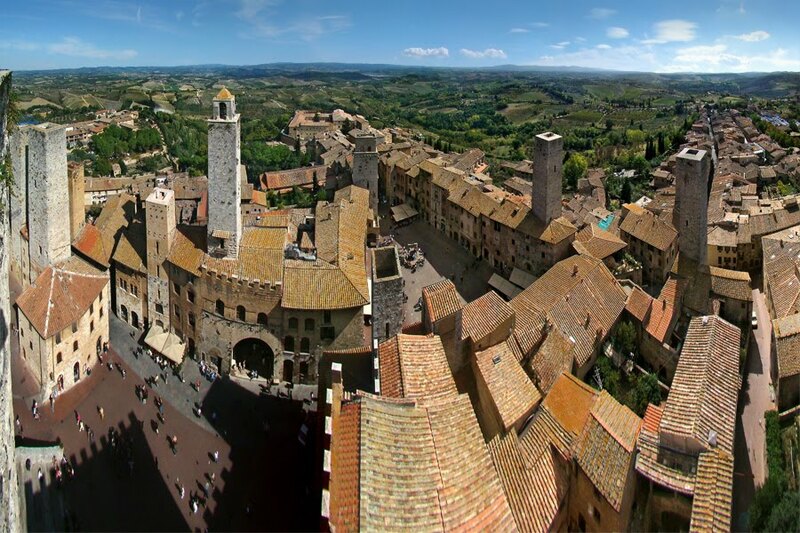 The service at San Gimignano was top class, attentive and unobtrusive. Nice. If you have had a brush with the Royalty ! Ahem ! Polity ! do write in.